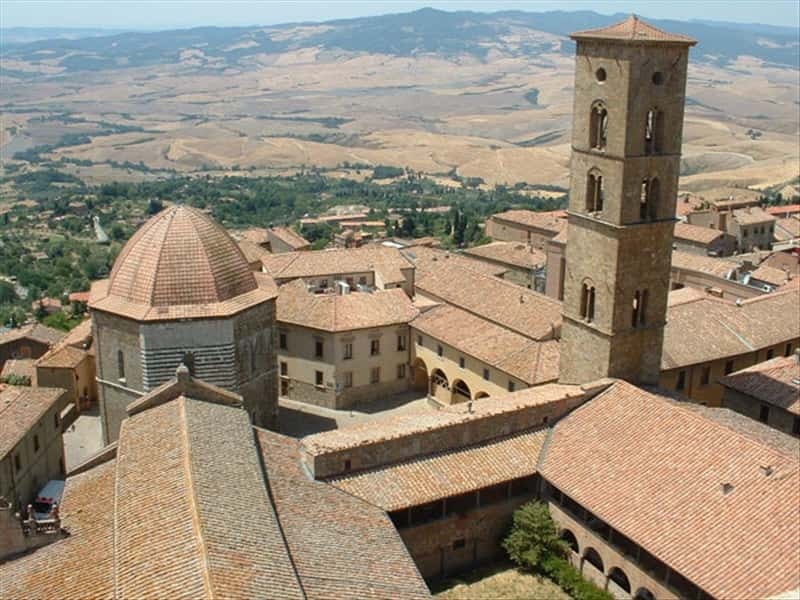 Volterra is set between the upper valleys of Erra and Cecina. Famous for the extraction of the alabaster, It was an important Etruscan center in the past: they settled this place in the VII centuty B.C., the Etrurians created the city of Velahtri, which was surrounded by a seven-kilometre wall since the IV century B.C. Inside Velahtri not only the inhabitants but also the pasture and farming areas were protected. It became one of the twelve territories ruled by the Lucumoes of the Etruscan League. It was conquered first by the Romans and then by the Lombards. In 1361 it passed under the control of Florence. The historical centre is rich in valuable monuments, dating back to the Etruscan period (Porta dell'Arco and Porta Diana), Roman remains and medieval buidings, such as the Cathedral and Palazzo dei Priori. and a nave flanked by two aisles. The Baptistry of San Giovanni was erected in the second half of the XIII century in octagonal base and is decorated with stripes of white and green marble. Palazzo dei Priori, set in the homonymous square, was built in 1239 and it is surmounted by a pentagonal shaped tower. Inside it is possible to admire many important works of art and the coats of arms of the Florentine magistrates. The Medici's Fortress, built on the upper part of the Volterrano mount, is characterised by two different tower: the Rocca Antica and the Rocca Nuova, linked together by a strong boudary wall. It became a political penitentiary. The Roman theatre of Vallebuona, which was built in the Augustan age by the Caecina family following the example of the Greek odeums, was founded during the archaeological excavations of 1950. Finally we have also to mention the Acropolis of Pian di Castello and the V century b.C. Etruscan Necropolis, caved into the sandstrone below ground level. This town web page has been visited 32,398 times.